IJETT is participating with the arXiv.org program sponsored by Cornell University Library to improve the citation counts of the articles and subsequent improvements in the impact factor. We also request the IJETT authors to post your published IJETT PDF document in the Cornell University arxiv library. How do I post my manuscript on arXiv? 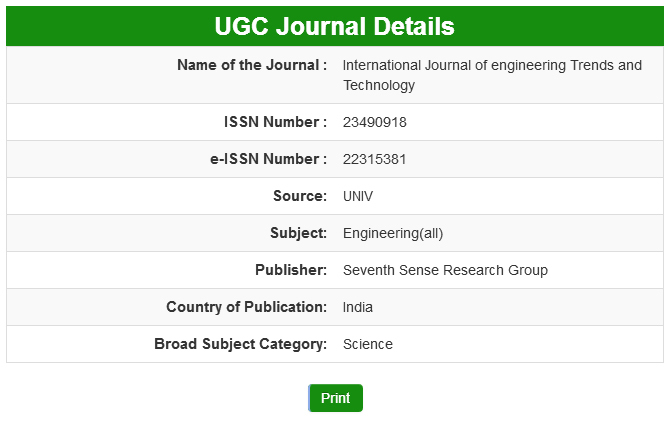 It is mandatory to acknowledge that the paper is published with International Journal of Engineering Trends and Technology. While uploading the paper on arXiv, the author will be asked to submit meta-data details regarding the paper. This section will explain the various parameters that the authors will encounter while uploading the paper. Title : The complete name of the article. Do not use all upper case letters. Authors: Include the names of all authors. The list of authors must be similar to the one published with IJETT. The rule is that all names should be given in the order, FirstnameLastname or FirstnameMiddlenameLastname (where Lastname is your family name). Comments: Indicate number of pages and number of figures. Also mention the statement "Published with International Journal of Engineering Trends and Technology (IJETT)"
Category: Each arXiv article has a primary category and may also have one or more cross-lists to other categories. Journal-ref: This field is mandatory. Copy the citation data available in the citation section on the abstract page of the article in the IJETT website and paste the same. Dhanunjayudu.K, Mahesh.B. Article: Trust-Based Secure And Energy Efficient Routing Framework For WSNS. International Journal of Engineering Trends and Technology (IJETT) 5(1):1-5, November 2013. Published by Seventh Sense Research Group. DOI: Include the DOI allotted to the article by IJETT. Go to the article abstract page on the IJETT website to refer the DOI.